The X-ray Diffraction Unit gathers all the techniques which are based on the diffraction of X-rays on crystalline solids. It gives support in the characterisation of chemical compounds which are available in a crystalline state. Two principal techniques are available: Powder X-ray Diffraction (PXRD) and Single Crystal X-ray Diffraction (SCXRD). The PXRD technique is used basically as a primary screening method and delivers a finger print of each different crystalline form analysed. This method gives a basic service to all users at the ICIQ with a system which allows easy sample preparation and short measuring time for a high number of samples. The SCXRD technique delivers a three-dimensional structure at atomic scale of a selected crystalline compound. This method is highly specialised with a system fitted together from high performance components. The objective in this case is to give a direct support to the research groups solving problems in all levels of difficulty. This support includes the crystallization of problematic samples, the preparation of crystals of poor quality and the refinement of troubling datasets. 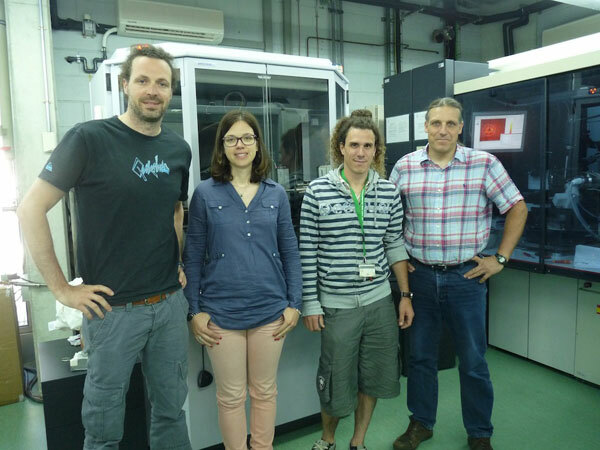 This unit has received funding from Ministerio de Ciencia, Innovación y Universidades, Agencia Estatal de Investigación, FEDER (EQC2018-005121-P). D8 Advance Series 2Theta/Theta powder diffraction system using CuKa-radiation in transmission geometry. The system is equipped with a VÅNTEC-1 single photon counting PSD, a Germanium monochromator, a ninety positions auto changer sample stage, fixed divergence slits and a radial soller. Programs available: Data collection with DIFFRAC plus XRD Commander V.2.4.1 and evaluation with EVA V.12.0. and TOPAS V.6. 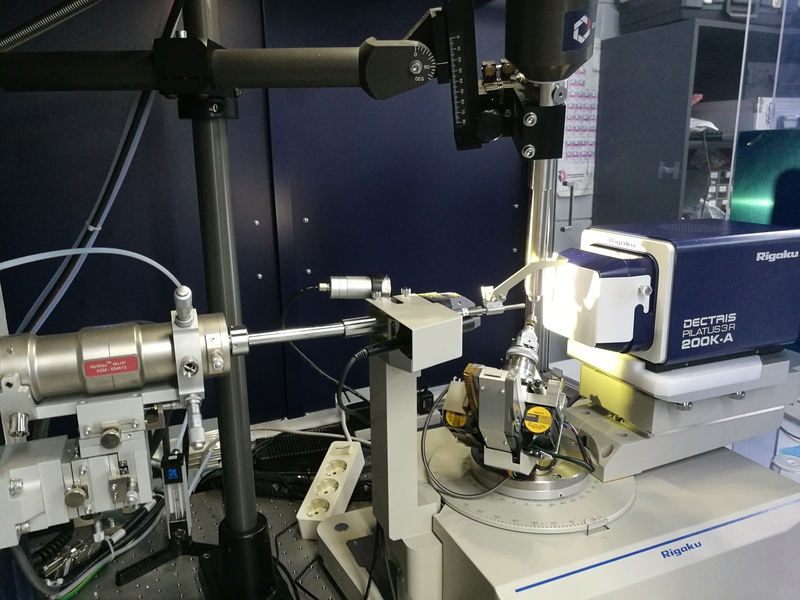 Rigaku diffractometer equipped with a Pilatus 200K area detector, a Rigaku MicroMax-007HF microfocus rotating anode with MoKa radiation, Confocal Max Flux optics and an Oxford Cryosystems low temperature device Cryostream 700 plus (T = 90-500 K). Programs available: – CrystalClear-SM Expert 2.1 b29 – CrysAlisPro 1.171.39.46  Rigaku, 2013. R. O. Diffraction, 2017. 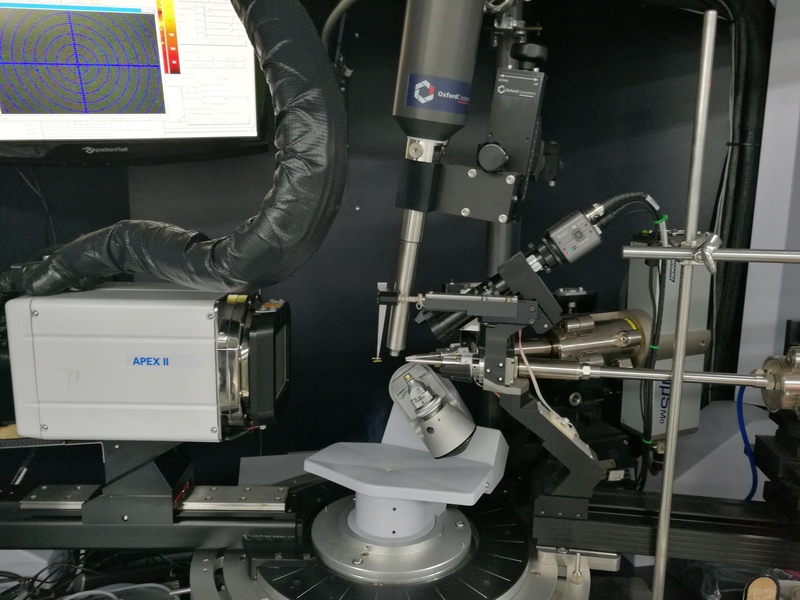 Bruker diffractometer Apex DUO equipped with a Kappa 4-axis goniometer, an APPEX 2 4K CCD area detector, a Microfocus Source E025 IuS using Mo Ka radiation, a Microfocus Source E025 IuS using Cu Ka radiation, Quazar MX multilayer Optics as monochromator and an Oxford Cryosystems low temperature device Cryostream 700 plus (T = 90-500 K). Programs available: – Data collection with APEX II version v2013.4-1.– Data reduction with Bruker SAINT version V8.37A. – Absorption correction with SADABS v2016-2 and TWINABS v2012/1. – Powder X-ray Diffraction and variable temperature Powder X-ray Diffraction measurements with the utility in Pilot: XRD2Eval (Bruker AXS). Bruker-AXS, v2013.4-1 ed., Madison, Wisconsin, USA, 2013. 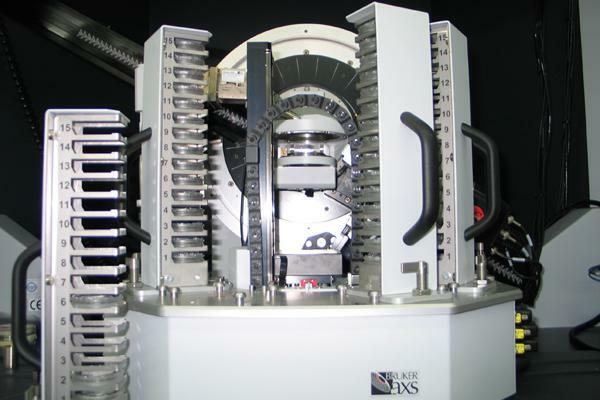 Bruker-AXS, v8.37A ed., Madison, Wisconsin, USA, 2013. L. Krause, R. Herbst-Irmer, G. M. Sheldrick, D. Stalke, J. Appl. Cryst. 2015, 48, 3-10. G. M. Sheldrick, 2012. – SHELXT; V2014/4 – SIR2014 v17.10 – SHELXle – SHELXL-2018/3 – Crystals – Wingx Version 2014.1 – Platon – MoProGui v18.05  G. M. Sheldrick, Acta Crystallographica a-Foundation and Advances 2015, 71, 3-8. M. C. Burla, R. Caliandro, B. Carrozzini, G. L. Cascarano, C. Cuocci, C. Giacovazzo, M. Mallamo, A. Mazzone, G. Polidori, J. Appl. Cryst. 2015, 48, 306-309. C. B. Hubschle, G. M. Sheldrick, B. Dittrich, J. Appl. Cryst. 2011, 44, 1281-1284. G. M. Sheldrick, Acta Crystallographica Section C-Structural Chemistry 2015, 71, 3-8. A. L. Thompson, D. J. Watkin, J. Appl. Cryst. 2011, 44, 1017-1022. L. Farrugia, J. Appl. Cryst. 2012, 45, 849-854. A. Spek, Acta Crystallographica Section D 2009, 65, 148-155; A. L. Spek, Acta Crystallographica Section C-Structural Chemistry 2015, 71, 9-18. C. Jelsch, B. Guillot, A. Lagoutte, C. Lecomte, J. Appl. Cryst. 2005, 38, 38-54.